A high-ranking Venezuelan air force general publicly recognised Juan Guaido as interim president in a video circulating on social media on Saturday in the biggest military defection Nicolas Maduro’s government has seen so far. Francisco Esteban Yanez Rodriguez said he disavowed the “dictatorial authority of Nicolas Maduro,” and called on the rest of the military to do the same. 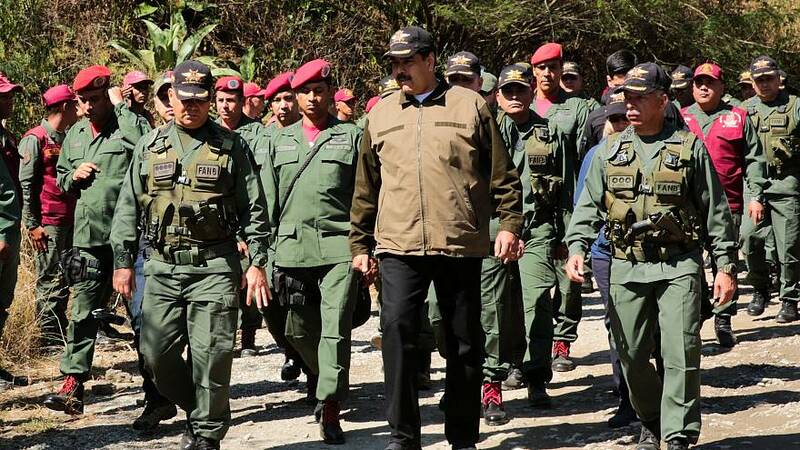 "People of Venezuela, 90% of the armed forces of Venezuela are not with the dictator, they are with the people of Venezuela," Yanez said in the video. “To continue forcing military forces to repress our people is to continue with more famine deaths, diseases, and hopefully not a civil war. Our people have already gone through a lot,” he said, requesting that Maduro leaves the country once and for all. The video was published on the same day that opposition supporters were set to protest against Maduro's regime. Washington has been exerting pressure by instating sanctions on the state-owned oil company PDVSA in a bid to oust the left-wing president from power. Maduro will hold a rally at the same time to commemorate the 20th anniversary of the late socialist leader Hugo Chavez's first inauguration as president in 1999. Minutes after the video appeared, the Twitter account of the Venezuelan air force shared a picture of Yanez Rodriguez with “traitor” written in big red letters. Guaido was proclaimed interim president on January 23 by the National Assembly as a direct challenge to Maduro's rule and quickly won the support of other countries in the region. However, he still has no control over the government's institutions or daily governance.